The best workout plan for men over 40 is Burn The Fat - Feed The Muscle. Lose male belly fat and become more muscular. To me, the best workout plan for men over 40 is Burn The Fat - Feed The Muscle. Created by exercise physiologist and natural bodybuilder, Tom Venuto, you will get rid of belly fat and gain lean muscle. As guys approach 40, testosterone accelerates its decline in production. 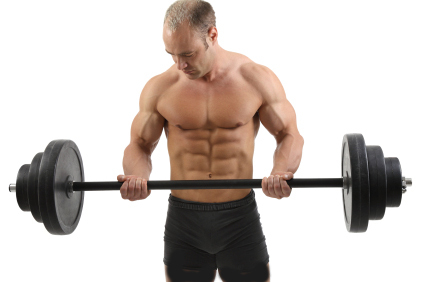 Men notice a decrease in energy, a reduction in strength and muscle mass, and an increase in body fat. According to MSN Health, excess body fat decreases testosterone production and breaks down the testosterone that is already in your system. Keeping your athletic skills, and maintaining a lean, muscular body becomes much tougher. Many guys turn to a restrictive diet, a harsh workout program, or even phony, expensive, (and totally worthless) supplements in order to keep what they had...and get rid of what they don't want. Sadly, none of this stuff works. Guys foul up their metabolism, get increased carb cravings, get injured more frequently, and shell out a lot of money for supplements that get about as much results as eating rice cakes. Searching the Internet for the best workout plan for men over 40 yields tons of programs promising you can look an NFL defensive back in just 12 weeks, or get down to 7% body fat with just 3 workouts per week of 7 minutes each. Do you really believe you can reverse years of aging with only that little amount of exercise? I purchased it for two reasons: One, Tom did NOT make any outrageous promises about getting a better build. He was up front in saying, "If there’s any 'secret' to fat loss and building muscle, it’s hard work on your diet and training program. The sooner you accept this fact, the sooner you’ll be the proud owner of a lean body. Unfortunately, this isn't what most people want to hear. In this age of instant gratification, people want overnight success and 'miracle cures,' but that's a fantasy." Secondly, I liked his premise about losing body fat. He summed this up by saying, "Your goal should never be weight loss. Your goal should be losing fat while maintaining muscle. As long as your body is solid muscle, then you shouldn’t worry about what the scale says. Your ratio of muscle to fat is what really counts." * One look at Tom, who is over 40, and you can easily see that he follows his own advice. Sure, he has a degree in exercise physiology, but that doesn't do him a bit of good unless he sticks to the nutritional and workout guidelines he provides in his eBook. * Tom's program centers on a comprehensive plan to get rid of male belly fat and increase lean muscle mass: Goal setting, solid nutrition, fundamental strength training with weights, and intelligent cardio that features interval training. * Tom's Burn The Fat book is detailed, organized, and easy to understand. * You will discover why you need to get sugar foods, fried foods, and refined carbs food (all the stuff that tastes good, but stores fat instead of building muscle) OUT of your current diet. * Tom provides four different weight training programs, and shows you how to make critical modifications as you lose fat and become more muscular. "Some of the information you’re about to learn may surprise or shock you. Most of it however, is so simple and straightforward, you’ll kick yourself for not “getting it” sooner. (But you’ll soon get over it when the fat starts melting off your body, revealing the chiseled muscle definition underneath!)" There is no single workout plan for men over 40. Getting back in shape, getting rid of male belly fat, and increasing your muscularity MUST include all elements of goal-setting, optimal nutrition, strength building weight training, and interval training. Tom Venuto covers all aspects. If you are looking for the best workout plan for men over 40 his Burn The Fat - Feed The Muscle should be high on your list.